Spring has sprung! We have some interesting articles for you to read and several sale and discount options. Hope the weather is beautiful wherever you are and you and your parrots are relaxing and having fun! Phoenix Foraging Rolls Named as All Star Winner for 2011 by Constant Contact! According to Constant Contact (our newsletter service provider) we were chosen as one of the top 10% of businesses in the effort we make to provide good service to our customers. It also says that it means our customers noticed and responded. So thank you to all of our customers. You are all such great people!! We want to try to increase activity and use of both our Facebook page (https://www.facebook.com/PhoenixForagingRolls) and our blog portion of our web site (http://blog.phoenixforagingrolls.com). If you post something relevant to parrots, especially about food or foraging, send us a link and we will send you a coupon for 15% off your next purchase. This is for the rest of this month only. All seeds and nuts will be marked down this month. Last summer we had a seed moth outbreak (they are not harmful to parrots and indicate that the food has not been sprayed with pesticides, but we still know you don’t like getting them in the food you buy). With the early warm weather we are guessing that it will be likely again this year. We keep all our foods cool here but do not have the space to refrigerate and freeze everything. So we are encouraging you to stock up on any seeds and nuts NOW and keep them in your own refrigerator to avoid the bug problem. We know some of you have missed the papaya rings but we didn’t find any that met our standards over the winter. They must have been picked too green and were falling apart. They are back in though and we have put it back up on the web site. 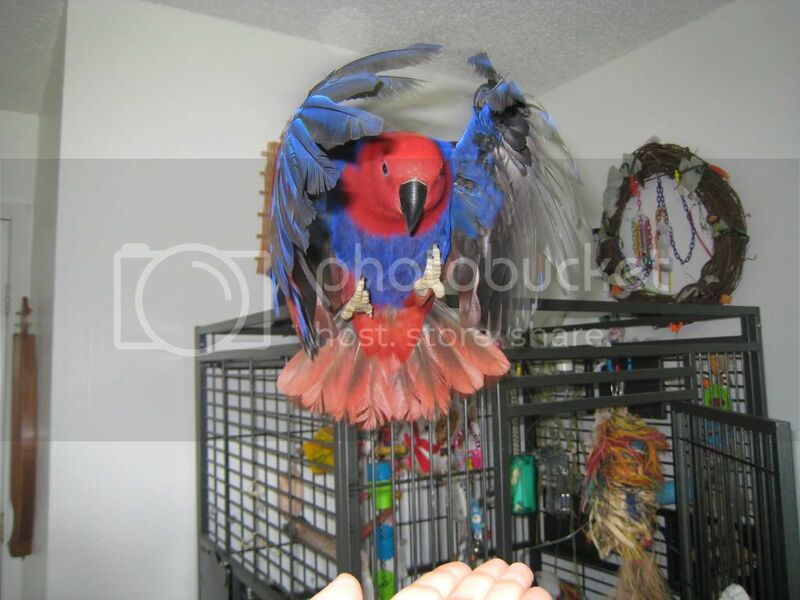 From Beaks To Barks, in which I am an avian behavior consultant, a pet sitter specializing in birds and animals with medical and behavioral special needs, and a relief veterinary technician. I also co-founded and co-run the Austin Parrot Society, which we created for the purpose of providing a community and support network for bird owners, breeders, and anyone who might be considering bird ownership as well as a rescue and rehab center, with an increasing number of people surrendering their birds to us or asking us to help them find a suitable new home for their birds. We are hoping to get our 501(c)3 and start a more structured, formal rescue and rehab center in the next year or two, and are always on the lookout for people who are willing and able to assist us in this endeavor. 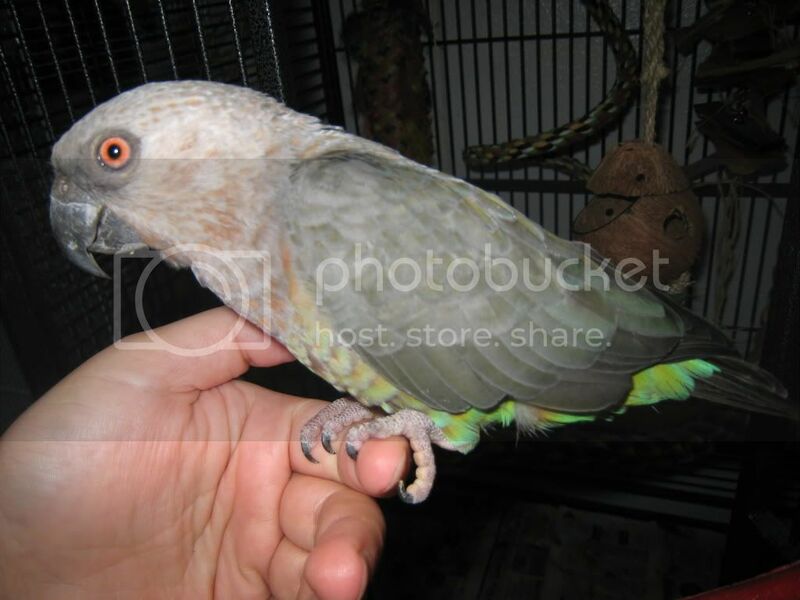 How many and what type of parrots do you have? 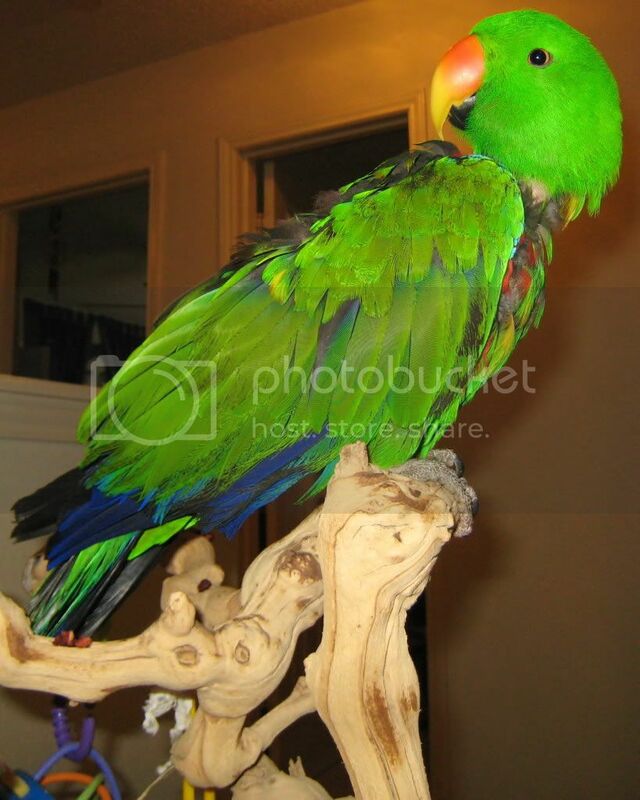 I have a male RS/Vos hybrid Eclectus named Bayu, a female Aru Eclectus named Cah’ya, a Red Bellied Parrot named Yodit, a Brown Headed Parrot named Zuma, a Bronze Winged Pionus named Ernie, and a Hawkheaded Parrot named Archie. What do you like most about having parrots in your life? So many things! Of course they are funny and affectionate and smart and so much fun to be around, but I think by far the greatest gift they’ve given me is patience and compassion. I also am a very emotional person, and they have taught me how to breathe, be calm, and have better control of my emotions. I know it sounds funny to say that, since birds tend to be so emotional themselves! But that’s precisely why: they are so sensitive to my emotions that if I’m tense or upset or sad, they respond with a magnification of my own emotions. So they have in that way become a mirror through which I become aware of myself, and remind me that I need to take a step back, breathe, and find a way to become calmer and more positive. When I am able to do that, they reward me with a calm, positive response! What do you think people considering getting a parrot need to know? Above all, that the learning process is never over. But also, there is a lot of bad information out there, and a lot of opinion being passed as fact, and a lot of pressure to be a “perfect” bird owner, all of which can be very discouraging. I think it is important to know that you should do everything you can to get as much information as you can, get as many opinions as possible, even ones that seem to directly conflict with each other, but then to decide for yourself what works best for you and your birds. And to know that there are several “right” ways to do things. Don’t let other people tell you that you are right or wrong; just take their advice into consideration, make an informed decision, and learn to be happy with the decisions you make. Guilt is counterproductive. All you can do is keep learning, keep making improvements when and where you can, and above all, try to make your routine enjoyable and sustainable for both you and your bird(s). That is the only way that you and your birds can happily enjoy and long life together. What do you feed them? In their bowls, all the birds get what I call “chop’n’freeze”, which is a combination of chopped organic seasonal vegetables, organic cooked grains and legumes, a sprouted seed mix from Sprout People called “Dr. Bird”, a mix of herbs and supplements from Mountain Rose Herbs, and Red Palm Oil and Coconut Cream Concentrate from Tropical Traditions. Then, depending on their species and their weight, I will add to the chop’n’freeze bits of scrambled egg with the crushed eggshell mixed in, chopped organic raw mixed nuts, organic fruit, or any combination of the above. In their foraging toys they get Phoenix UnPellet and Kwackers, and for all the birds except the Ekkies, a mixture of TOPS and Harrison’s pellets. Do you have some foraging or enrichment ideas you’d like to share? I don’t make a lot of money, so I’m all about recycling as much as possible. I hang fennel tops and carrot tops in their cages as a form of foraging/browse material. I ask local lawn maintenance workers if they will give me a bag of bamboo cuttings, and I use the leaves as stuffing in their foraging toys, small branches as browse, and large branches to make toys and perches. I turn any empty cardboard box into foraging toys: garbage bag boxes, cereal boxes, cracker boxes, toothpaste boxes, boxes that are mailed to me… literally anything cardboard becomes a foraging toy. That’s one of the ways I save money. 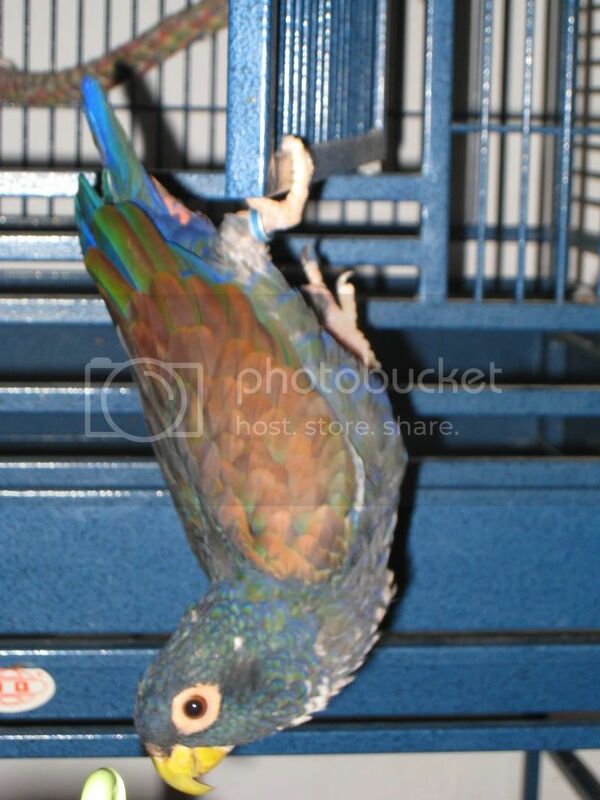 Do you change the cages around from time to time or do your parrots prefer to not have any changes? The basics – like bowls, perches, and swings – tend to stay the same for three reasons: 1) Phoebe Green-Linden makes a very good point when she says that a cage is a bird’s house, and constantly rearranging their cage would be like someone coming into your house and constantly rearranging your furniture; 2) I carefully plan out their cages for maximum usage and minimum poop contamination, so if it ain’t broke, don’t fix it; 3) I’m a firm believer in working smarter, not harder. However, the foraging toys that constantly get used must be replaced, and I like to put new toys in various areas around the cage so they always have something new and fun to explore. What one thing do you wish you had known before you got a parrot? I wish someone had told me that I DON’T have to always do everything that the so-called “experts” said that I had to do, or buy, or use. I would have saved myself so much money, stress, and guilt if I had just done what made the most sense for me at the time. But, you know, live and learn! 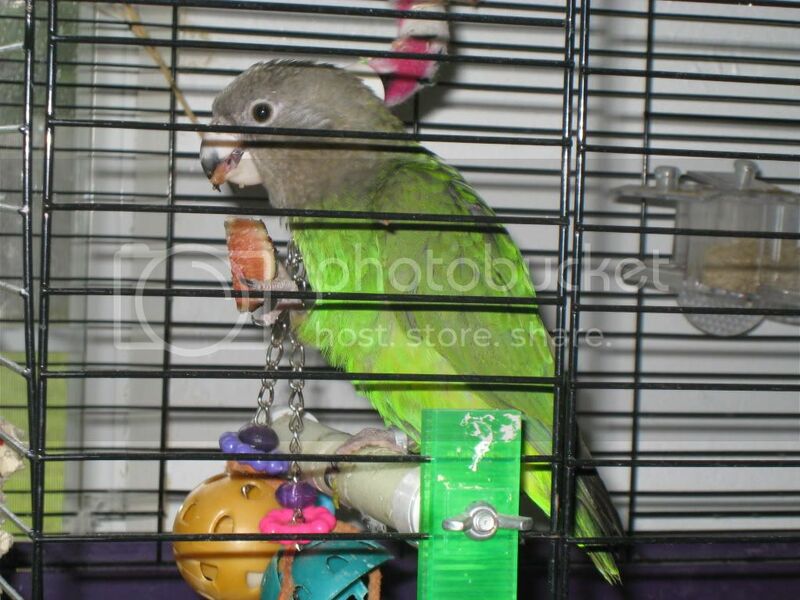 This entry was posted in Birds, Fun, My crew and tagged just for fun, parrots, Phoenix Foraging. Bookmark the permalink.